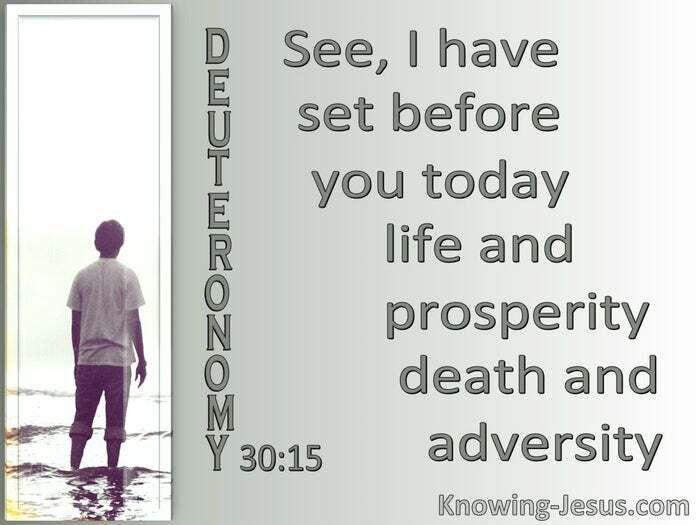 What Does Deuteronomy 30:15 Mean? Israel were God's chosen people, who had been brought out of Egypt, after 400 years of slavery - just as the Lord had promised Abraham. They were to be God's ambassadors on earth, and He made a conditional covenant with them, that they would be blessed in every area of life, if they would but honour His name, trust His word, and obey His commands. They were warned, however, that should they be disobedient to Him and break their promise, they would face God's chastening hand, and would suffer the consequences of their foolish rebellion - which would result in curses and death. Though already justified by God through their faith in Him, Moses set before them a choice - life and prosperity, OR death and adversity. The first generation of Israelites demonstrated their faith in God by obeying His command - killing a Passover lamb and smearing its blood on the lintels of their houses, as instructed by the Lord. 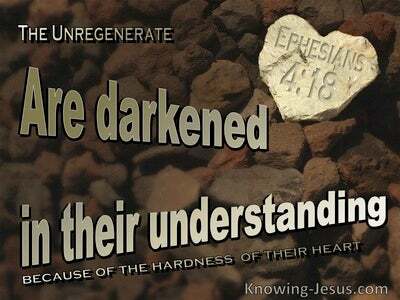 However, once they were redeemed, they started to murmur against Him, and their disobedience resulted in 40-long years, of wanderings in the wilderness - saved from slavery and redeemed by the Lord, yet alienated from fellowship with God, and living a defeated life. That generation chose death above life - saved but living a defeated life. They were a justified group of people, who had been redeemed from Egypt. They were saved by God's grace, but sadly disbelieved His promises and did not maintain fellowship with Him. Consequently, they did not enjoy the blessings and benefits of a victorious life, which trusts the Lord, obeys His commands and depends on His sufficient strength - for the journey through life. 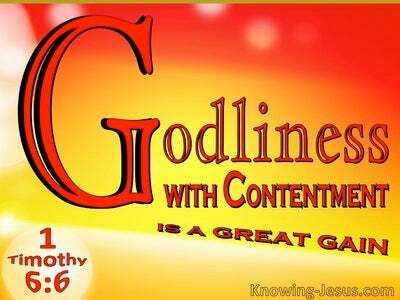 Moses now addressed a new generation of Israelites. Not only did he remind them of the covenant agreement, which their fathers had made with the Lord, some 40 years earlier, but offered them the same terms - that blessing would follow their obedience, while cursing would result in disobedience if they followed in their parent's rebellions footsteps. The entire book of Deuteronomy, simply restates the conditions of Israel's covenant agreement with the Lord, together with a solemn warning, of the choice they must make. The unanimous reaction of this generation was: Go near, and hear all that the LORD our God says, then speak to us all that the LORD our God speaks to you - and we will hear it and we will do it. This second generation of Israelites, were also justified because of their faith. 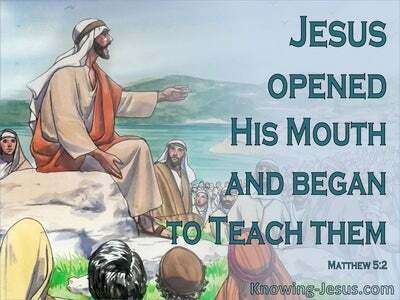 They also promised to walk in His ways, keep His statutes, obey His commandments, carry out His ordinances and listen to God's voice. Like Abraham, who believed God's word, this generation of Israelites were also justified because of their faith - not because of their parentage. Israel were God's chosen people, who were called to demonstrate to the gentile nations, how a people, separate unto God, should live. However, they were not automatically saved because of their natural heritage, nor were they justified by keeping the Law. Jew and Gentile alike are only justified by grace through FAITH. Like Abraham, and all the redeemed, we are justified by grace through faith. 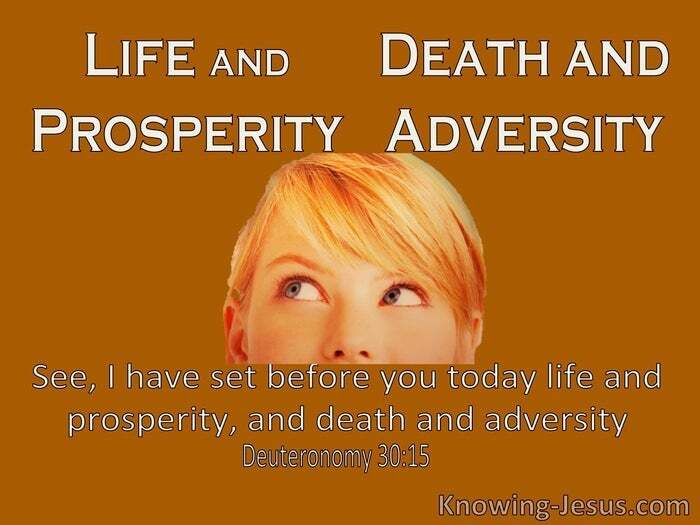 But once saved, God sets before us all life and prosperity OR death and adversity. Once saved every believer is confronted with this choice. To live for God and trust His word OR to live for self and doubt His word.. to obey His voice as we journey through life OR to disobey the word of the Lord, and waste the short time we have on earth. To save our life (our soul) OR to lose our life (our soul) - as Jesus said, for whoever shall save his soul-life shall lose is (death), and whoever loses his soul-life for My sake shall find it (life). We either grow in grace and mature in the faith, through submitting to Him OR remain in spiritual infancy and waste our opportunities to honour His name. 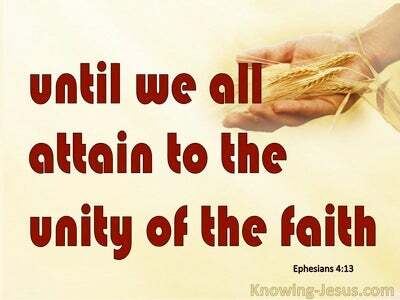 We either work the works of God by faith and enjoy sweet fellowship with our heavenly Father, OR ignore the work that God has prepared for us, go our own way and remain estranged from our God, and out of fellowship with our Lord and Saviour. This was the choice that lay before this second generation of Israelites as they prepared to cross into the promised land - and that day, Moses set before them life and prosperity, victory and honour - through living a life of faith, OR death and adversity, defeat and dishonour - through living a life of disobedience. A few chose to be strong and courageous by trusting the Lord and obeying His word, and they lived a victorious life for His praise and glory, as recorded in the Bible - but most abandoned the God of their fathers, disobeyed His word, lived a defeated life and did only those things which were right in their own eyes. Heavenly Father, thank You for the lessons that I can learn from the history of Your people Israel. Help me to make the right choices as I continue along the path of life. I pray, that by Your grace, I would choose to live a victorious life, that trusts to Your word, submits to Your will and honours Your name, in every eventuality of life. May I quickly confess my faults, and choose life - to the saving of the soul, and not death - this I ask in Jesus name - AMEN.